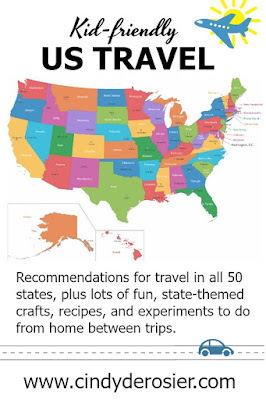 Cindy deRosier: My Creative Life: 50 States Album Update + Little Passports Giveaway! I haven't had a chance to really look at your "United States Travel Resource" posts as I like to have time to really explore them... but I want to say congrats to your success w/ them!! Looking forward to checking them out in the near future! BTW - Love the mini layout's you've posted here; especially the fact that they are in Trevor's words and writing!! early Explorers would be fantastic for my grandson! I've really enjoyed reading about your adventures...what a great learning resource for kids (and parents). How awesome!!! I am LOVING the photos you chose for your pages!!!!!!!!!!!!!!!!! This is such a fabulous travel recourse and it's amazing for the whole family!! I can't wait to dive into your travel resource! I think we'd like the USA edition if we were lucky enough to win. I have looked at the places you have visited. Alaska really stood out for me. I can't wait to go there, and you make it simple by breaking down the activities by type. If I won the USA edition would be nice. I am excited to see when you finish it. Alaska, best one so far! If I won the USA edition would be great! You are such a creative person! I think we'd like to The USA version if we won. I think the USA edition would be great! Great job on the pages! My nieces said they would love the world edition! Thanks for the chance! The pages are excellent! I'm eyeing the world edition since my nephews will be traveling abroad next year.